Fuzzball & Scuzzball - Who Will Stand Against . . . HATE FROG? Comic 278 - Who Will Stand Against . . . HATE FROG? Welcome to the latest installment of the epic Hell Hath Lots of Fury storyline. Today also sees the release of page 5 of my other web comic, The Electric Team. I don't draw that one, I just write it, so it's way prettier than this one. Anyway! Today's comic was visually inspired by episode 238; if you look, you can see I copied all kinds of things from that one. It seemed appropriate, and somehow that was actually 40 episodes ago. Time flies. 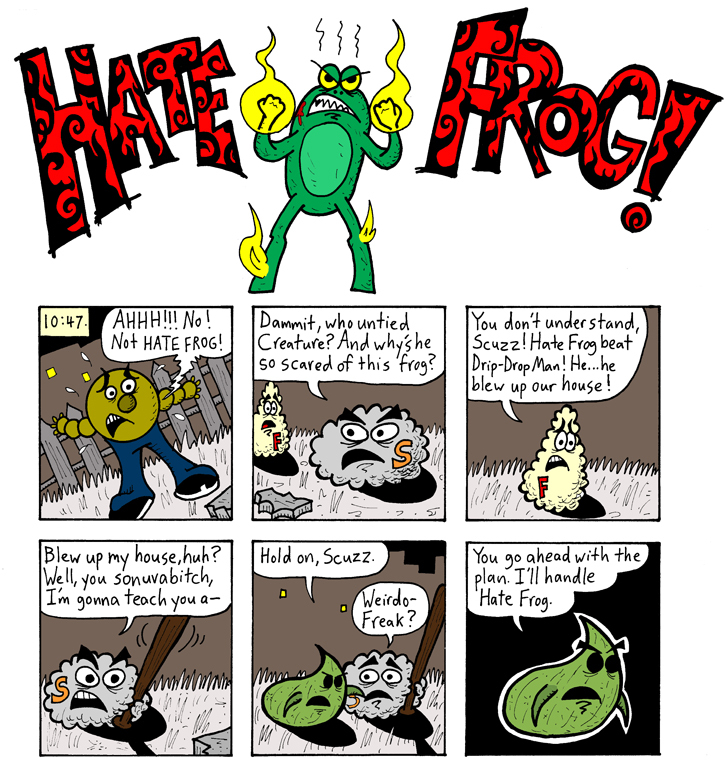 It's been a long, eventful journey, but here we are, with Fuzzball, Scuzzball, Creature the Creature, and Weirdo-Freak all together again, with Scuzzball face-to-face with Hate Frog for the first time. It's all coming together, as we get closer and closer to the climax of this, the longest Fuzzball & Scuzzball story ever. NEXT WEEK: OH MY GOD, GET READY--it's Weirdo-Freak VS. Hate Frog! The battle you didn't know you wanted, but soon you won't know how you lived without it!!! !